The field of welding has evolved; presenting so many different techniques that one can use to carry out their welding projects. To be able to choose the process of welding to work with, it is essential to understand all the processes and when it is best to use them. Let us look at the types of welding below in detail. The term bare derives from the fact that the electrode in use is not coated or is very lightly coated. Bare metal arc welding joins metals by heating them with an electric arc formed between the bare electrode and a workpiece. 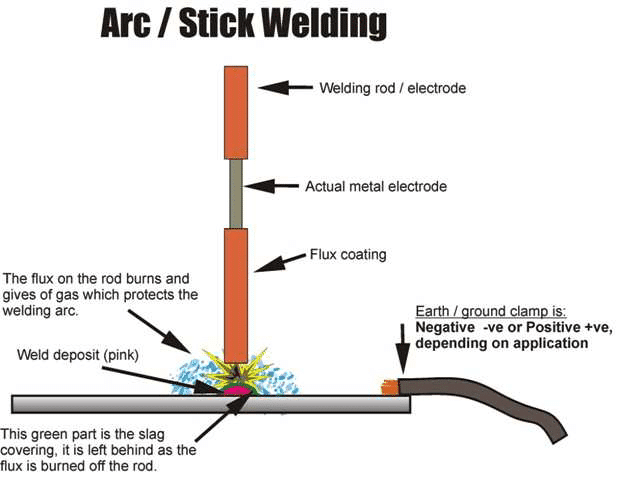 It is the easiest and most popular arc welding methods also known as Manual Metal Arc Welding or Stick welding. The electrode, in this case, consists of a mixture of coatings including minerals, chemicals, and iron powder. The electrode coating once melted in an arc produces weld metal that joins two metals and a protective slag that you should remove for a clean finish. Carbon arc welding uses a carbon or graphite electrode which is non-consumable to form an arc between itself and a workpiece in which metals heat and join. It is among the first types of arc welding to be developed though it has faded with time upon the resurgence of twin carbon arc welding whereby two carbon electrodes are used, and an arc is formed between them. This type of welding makes use of flux filled tubular electrodes. If the flux is emissive, it acts as a shield against air that could contaminate the weld pool. If the flux is non-emissive, extra shielding gases will be necessary. Flux cored arc welding works well with thicker sections because of its high deposition rate. Gas metal arc welding is also known as MIG welding, where a gas shields the arc. This gas could be argon, helium, or a mix of the two. Electrodes come with deoxidizers which prevent oxidation making it possible to weld a number of layers. You can use MIG when welding thin metals. Gas tungsten arc welding is also known as TIG welding as it uses tungsten electrodes which are non-consumable. In this case, filler wires are needed to add molten material to the arc as the electrode is non-consumable. Shield gases are also used to protect the arc. Tungsten welding is the most challenging type of solder but also one that produces very little slag hence usable when good-looking welds are needed. Plasma welding is a technique that makes use of ionized electrodes as well as gases which create hot plasma jets that target the welding area. The heat of the jets makes it suitable for speedy, deep, and narrow welds. The electrodes in submerged arc welding are made from granular flux that forms a thick layer when welding, covering the molten metal and preventing spatter. The thick layer acts as a thermal insulator enabling heat to penetrate deeply. This method is limited to welds done horizontally. This method uses two tungsten electrodes heated in an arc. You may use or fail to use a filler altogether as it is not necessary. Hydrogen gas is passed through the electric arc to prevent contamination in the form of oxidation. This method of gas welding is known as gas welding. It works by combustion of gases to create a flame. Oxyacetylene welding burns oxygen and acetylene to create a scorching flame. When the need for flame adjustment arises, you can make the changes by adjusting the volumes of both gases. You can use three types of flames. The most common is the neutral flame with equal proportions of oxygen and acetylene. An oxidizing flame has more oxygen than acetylene, while you can achieve a carburizing flame by increasing the volume of acetylene. The combination of these two gases is known to produce a very hot flame of 3100 degrees Celsius suitable for welding steel. Air acetylene welding uses a mixture of acetylene and air to produce heat. Acetylene gas regulated by a valve passes through a hosepipe and mixes with air for combustion. It has a lower flame temperature than that of oxyacetylene and is therefore used for tasks such as copper plumbing, a small cross-section of lead welding, and welding copper sheets of small thickness. Oxyhydrogen is a mixture of oxygen and hydrogen, the first mixture of gases used in welding. It is preferred to oxyacetylene welding due to its better efficiency and environmental conversation. With only water and electricity, the oxyhydrogen machine produces oxyhydrogen gas whenever it is needed. The oxyacetylene welding machine uses high-pressure oxygen and acetylene gas cylinder. Oxyhydrogen welding produces a flame of high temperature which is concentrated producing full and smooth solder joints. Oxyacetylene welding flame temperature is low, and the flame is spread. Both of these lead to poor quality welds. The welding speed is high in the oxyhydrogen welding due to the high temperature while the speed is low using oxyacetylene welding because the temperature of the flame is low. Oxyhydrogen welding has no carbon emissions, making it environmentally friendly as compared to oxyacetylene welding which produces toxic gases including CO2 and CO.
Pressure welding involves the application of heat or pressure or both metals to join them. The surfaces are heated by a source such as an electric current to a plastic state, and one forces the metals together using pressure. Resistance type of welding finds its application in the manufacturing sector for joining sheets of metal and components. A strong current is passed through the sheet combination to heat and melt the metals at local points. It is used to join 2-4 overlapping metal sheets. It is done by first cleaning the metal sheets and the electrodes to ensure removal of any contaminant such as grease or paint. You then pass a current through two copper electrodes to the sheets. Due to resistance, generation of heat occurs in the gaps of air between the sheets. The heat remains in the air gap as the metal is a poor conductor of heat compared to carbon. This heat melts the metal, becomes solid as the rate at which the heat dissipates is small, leading to the formation of a joint. It works the same as resistance spot welding but uses circular electrodes which rotate and create an airtight continuous weld. It performs overlapping welds with two or more sheets of metal passed between sheets of electrodes which transmit current and mechanical pressure for a welded seam that is gas and liquid tight. In this case, small projections are formed on one or either side of the base metal to create a contact point which localizes flow and concentrates heat. When pressure is applied, the hot and soft projections deform leading to the formation of a weld. Projection welding is mostly used for mounting attachments to surfaces where the welder cannot access the back side. Flash welding type of resistance welding uses no filler material to join metals. A current is passed to the metals to be joined, and the space between the two creates resistance which produces an arc that melts the metals. When the metals heat up enough, they are pressed together to form a forged weld. Upset welding joins simultaneously over the whole abutting area or along a joint. This happens through heat from an electric current passing through the area where the surfaces touch. Pressure is used before and during the heating period. Upset welding applies when the cross-sectional area of the parts is equal, and the parts have to be tightly clamped together. The heat and pressure join the surfaces and force is released once cooling takes place. It is used for welding of dissimilar metals and is more complicated compared to flash and upset welding as it makes use of an electric discharge at the joint and additional pressure to join the materials. It is used on materials with small cross-sectional areas and where you do not require a flash at the metal joints. Solid state welding is whereby you join materials at temperatures below their melting points without the use of filler material. In the processes of solid state welding, time, temperature, pressure or a combination of all these joins the base metals without melting them. In this type of welding, high pressure is applied at room temperature on very clean surfaces. In the case of thin materials, pressure can be obtained by use of hand tools while thicker materials need an extra press for extra pressure which will result in a good weld. A deformation is formed at the weld area joining the two materials. Cold welding is usually used to join aluminum and copper. Diffusion welding produces a weld through the application of pressure at elevated temperature for a long time in a vacuum. It can be used to join both similar and dissimilar metals. You need to eliminate surface contaminations first. The elevated temperature and gradual application of pressure permit diffusion at an atomic level. Deformation occurs at the interface surface allowing for further contact between the materials. Diffusion slowly removes the interface causing the metals to form a clean and robust joint. Diffusion welding is mostly used in aerospace and nuclear setting to join refractory materials. In explosion welding, welding is done by rapid movement of the parts and a controlled detonation. The energy produced causes the metals to join. It does not need the metals to melt for joining to take place, unlike other welding methods. Metals with differing melting points can, therefore, bond. This method is used to clad low-cost plates with expensive materials that are non-corrosive. It is also used to repair plug tubes in heat exchangers. Metals are joined by heating them in a forge by applying pressure or blows that can cause permanent deformation where the metals meet. It is used to join steel and iron, manufacture gates, in cookware, and welding short gun barrels. In friction welding, you obtain heat by mechanically inducing a sliding motion between the two surfaces. One part rotates against the other to generate friction until you reach a high temperature, and then you apply the pressure for coalescence to occur. This process requires no flux or filler material and is speedy as well as being able to produce quality welds. In hot pressure welding, materials are joined by the application of heat and pressure that deforms the base metal. The deformation cracks the oxide film on the surface increasing the area of clean metal. It is usually carried out indoors to allow for shielding and is mainly used for production in the aerospace sector. A similar method is hot isostatic pressure welding that uses a hot inert gas in the application of pressure. In roll welding, heat and pressure are applied using rolls instead of hammering and using blows, which causes deformation at the surfaces of the metals resulting in joining through diffusion. This process is used for making bimetallic materials. In ultrasonic welding, the parts to be joined are held together under pressure and joined by means of vibratory energy which moves at high frequency producing heat and resulting in deformation. It is used in many areas for example in the welding electrical connections to current carrying devices, plastic parts, packaging, and to assemble electronic components. Here is where a beam of high-velocity electrons generated through an electric gun is focused directly on the two materials that need joining through a magnetic field. The materials melt and flow as the kinetic energy of the electrons changes to heat due to the impact with the materials. It is ideal for clean and precise welds and for joining dissimilar welds as well as materials that are hard to weld. The process of electron beam welding has to take place in a vacuum to prevent gas molecules from scattering the beam. This type of welding uses a molten slag that melts the filler metal and the workpiece surface. The slag acts as a shield as welding proceeds. Welders use it for welding of thick pipes, tanks, ships, and generally to join large casting and produce a composite structure. A laser beam concentrates heat on the cavity between the two metals to be joined. It contains adequate energy to melt some material from the two pieces. This material deposits in the cavity, and a strong weld forms after cooling. It is mostly used in the automotive sector, and you can easily automate the welding with robotic machinery. Thermite welding process uses a filler material in liquid form or the melting of the base metal to enable joining after solidifying of the molten material. Thermite is a mixture of aluminum metal and iron oxide. The reaction of these two metals generates a massive amount of heat which converts them to the molten state. The iron being denser moves to the bottom of the crucible where there is an opening and joins the plates. As you can see, the list of welding processes is vast. For you to be able to choose the right method that will meet specific production qualifications, you need to consider several factors including the fill amount you need, the position of welding, the speed of travel, as well as penetration. 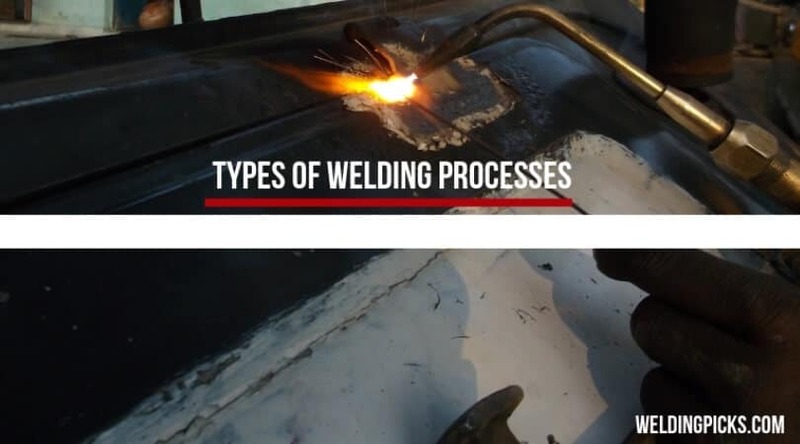 You can achieve most requirements with most of the welding processes but determining which process does the job best will give you faster and quality work. WeldingPicks is a participant in the Amazon Services LLC Associates Program, an affiliate advertising program designed to provide a means for sites to earn advertising fees by linking to Amazon.com.